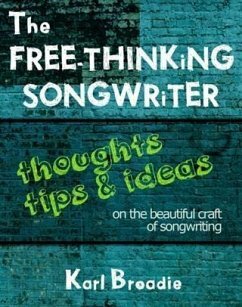 The Free-Thinking Songwriter should be considered a companion for all levels of songwriters, from beginners to hit-makers as well as soulful, organic songwriters alike. This book is brimming with insightful words of wisdom relating to the "craft" but more importantly, Karl shares thoughts that we can adopt as daily mindsets on our path. What path? The path of The Free-Thinking Songwriter. Karl Broadie is a natural writer in the best sense of the word, in that his musings and observations are from a deeply organic place, the wellspring of his heart and soul. A great song is that most mysterious and mercurial commodity, and when a song works best it's because the work that's gone into it seems almost invisible, it's a skill bordering on alchemy. In this regard Karl is an alchemist of a very high order, able to conjure great songs on a regular basis. The poetry he finds in the everyday, and the ability to consistently find an authentic way of expression is a key trait in Karl's work, and that he can turn his wordsmiths skills to tunes that are memorable and musical, is a bonus indeed. A writer can only connect with an audience in any meaningful capacity if they are honest and able to bare their inner selves for the world to see. Karl has mapped both the dark and the light in digging out some very deep observations of the human condition, like an explorer out there on the edge, marking the boundaries for those who follow. In the finest traditions of the singer-songwriter he continues to push himself into finding the most elegant and poetic ways of framing his explorations, and best of all he does it with more than a dash of wit, intelligence and humour. Karl is from a family or artists, writers and painters, and continues to keep that creative heritage alive and that artistic torch lit, holding out a glowing light for us to follow, admire, and if we're lucky, to guide by. Songs of heart and soul to enjoy and digest, songs that speak eloquently and flow like a river.